This is your last chance to benefit from the Marks & Spencer Easter Home Event! 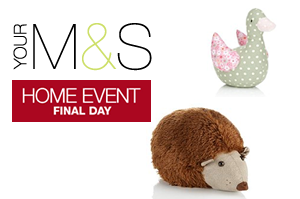 Today is the last day to buy the Hedgehog and the Fabric Duck Doorstops at a reduced price. The Marks and Spencer promotion knocks off an additional 20% from the price shown so the M&S doorstops only cost £12 each. The Fabric Duck and the Hedgehog doorstops are respectively rated by customers 4.5 stars out of 5 and 5 stars out of 5. Did you know? 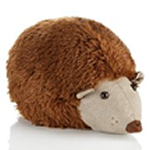 Being so popular, the M&S fans have even chosen a name for the Hedgehog doorstop: Wedgehog.